Although this property is private we still operate under Fish & Game regulations therefore a valid fishing license is required and must be displayed. 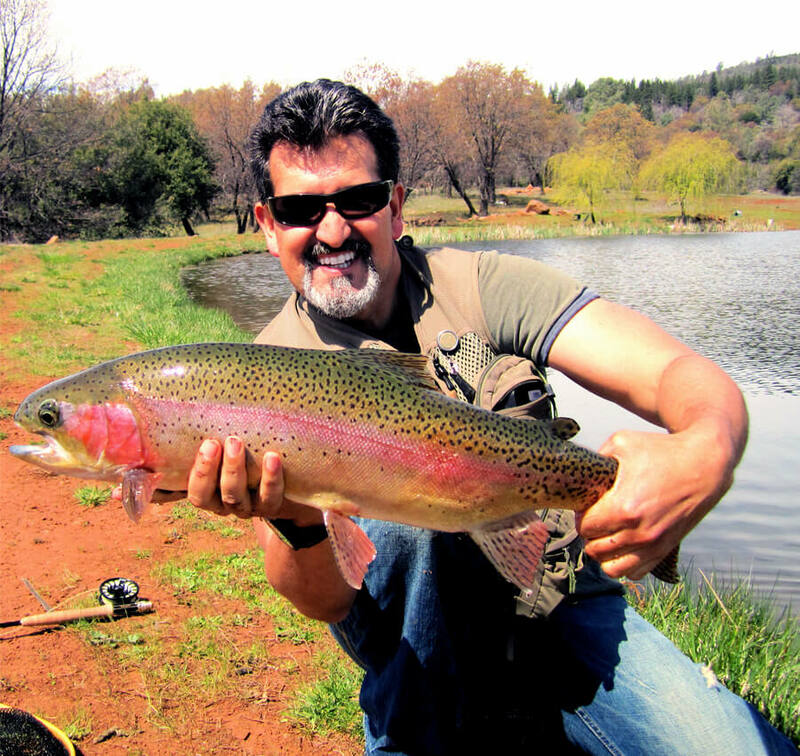 All of the ranch fishing is fly fishing with barbless hooks, catch and release. The stream is entirely canopied with a mixture of trees and has pool after pool filled with rainbows, lots of rainbows! You will find more than a ½ mile of easily accessible water to fish. If you want to extend this you can fish the stream for miles by walking up. This is quite a bit more difficult to negotiate, but it is worth the effort. The lower ranch lake offers an opportunity to take shots at some truly monster trout. You can fish it effectively from shore, but float tubing is allowed if you wish. The upper lake has more trout, giant bass and tons of bluegill if you need constant action. The upper lake is best fished with a float tube. We will show you the hottest spots! Rods of 4 to 6 wt are ideal. Leaders 9-19’ to 4x and 12’ to 5x will be best. Tippet spools of 4X, 5X, and 6X are necessary. Hip waders with rubber soles are perfect for the stream or lake shore fishing. We do not allow felt soles due to the risk of New Zealand mud snails. Chest waders are needed if you plan on float tubing the lower lake or upper lake. Please do not wade in the edges of the lakes. You may have to get your feet wet when landing one of the larger fish, but otherwise try to avoid wading. Also keep your wading to a minimum when fishing the stream. You may wade in and out of the stream, but please avoid wadding up and down stream. Also, try to enter & exit where there is gravel to avoid stirring up too much silt. Bring floating and intermediate lines. You will need long leaders tapered to 5x or 6x for the dry activity, and shorter leader tapered to 3x to 4x for the wet activity. Expect a lot of action using emerging insects just underneath the surface. Many of our regulars fish some type of dry or emerger with a dropper, short or long, and a nymph or midge pupa attached. Expect midge activity to start in early spring and continue all year. Mayflies start in late spring and early summer. Terrestrials are effective most of the season, especially after early spring. Leeches, damsels & dragonflies patterns seem to work best from late spring on. A crystal bugger or leech with a nymph trailer can be deadly. You must experiment with various retrieves at different depths until you strike gold! Many lake fishermen have great success fishing nymphs at various depths underneath an indicator. Just let them sit there for a bit, patience is a virtue at this point, and then pull it slowly back for another cast. In late season the water boatman activity is amazing! A few years ago we started having a hexagenia in early June. It is a spectacular site with trout jumping and black birds dive bombing these amazing bugs. If your trip is planned around this time bring those flies too. For the stream, shorter leaders tapered to 4x or 5x are more appropriate. Deer hair flies with short droppers or no droppers will produce. Nymphs of various sizes and colors should be in your box. Yellow Humpy’s, Stimulators & Elk Hair Caddis are high on our list for dries, but there are a number of other popular patterns, such as Parachute Adams, that will work well. Hanging a nymph underneath these high floaters can sometimes turn the trick. Black AP’s, PT’s, Prince Nymphs, & Golden Stones are some of the wet flies we would try first. Small nymph patterns begin to be the best choice in late summer & fall. Hoppers and beetles are a must most months! This is by no means an all exclusive list of flies. There are many other patterns that will work as well. However, this is a list of flies that represent patterns that any fisherman should have in their vest. Going to private ranches or to public water with three or four patterns will mean you stand a great chance of not having the right fly at the right time. You must bring all your own fishing tackle & supplies to Bailey Creek Lodge. This should include, but is not limited to, waders, boots, rods, reels, flies, leaders, tippet, etc. The lodge does not sell flies and does not have extra equipment. If you think you need it bring it! It is an hour drive to the nearest shop.